Army moms are proud moms, and they should be! 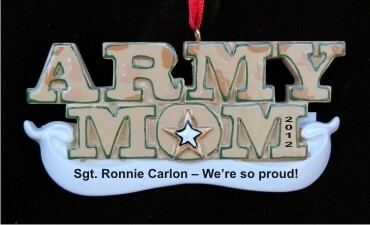 The Army mom personalized Christmas ornament is camo cool and customized with the name of the soldier she's proud to call her own. We add the soldier's rank and name and a year too at your option. A holiday cord allows you to display these military ornaments personalized by Russell Rhodes wherever they show the most support. One of our popular army ornaments personalized for special people, the Army mom camouflage Christmas ornament will prove to be an instant favorite when it arrives in our classic velvet gift and storage bag. Gift to Army Mom Sister Dec 29, 2014 Megan P.